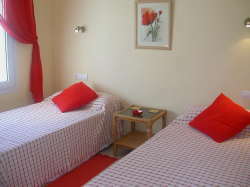 The accommodation comprises a living room with sofas, TV, DVD/CD player and dining facilities for 6. 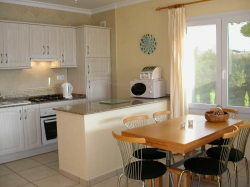 An American style kitchen is fully equipped with built-in gas hob, electric oven, microwave oven and fridge/freezer. An automatic washing machine is housed outside. There are 3 bedrooms - 2 double (with super king sized beds) and 1 twin. 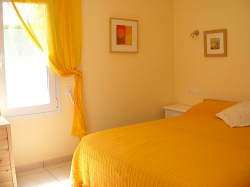 There are 2 bathrooms (1 en-suite to the master bedroom). Outside a large terrace surrounds the pool, with dining furniture for 6 plus sun-loungers. The pool has its own shower. 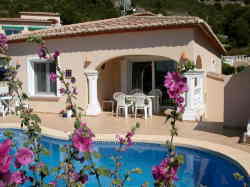 The surrounding country side is lovely for walking and there is golf nearby at Javea. The beaches at Moraira and Javea are only 10 minutes drive away. Denia - a short drive away has a lovely shoping area and the historic city of Valencia is only one hours drive away. Benidorm, with its varied attractions, is 30 minutes drive away .